Rock-a-bye baby in the tree top, when the wind blows, the cradle will rock . . . Many women struggling to conceive will be able to relate to Priya's longing to have a child. Miscarriage after miscarriage and failed fertility treatments add to her heartbreak and disappointment. After researching the topic, Priya convinces her reluctant husband to give surrogacy a try. They settle on a clinic in India called A House for Happy Mothers. Asha, the mother of two, is talked into being a surrogate mother by her husband and his family. They desperately need the money, barely able to afford the hut they live in. She also longs to send her son to a better school. He is obviously a gifted child, and would benefit from a better education. The cultural differences between both Asha and Priya are stark, from the roles women play in society to the lives they lead, including the economic disparity between the two. Priya is the daughter of a Caucasian man and an Indian mother. She was born and raised in the United States, and has made a life for herself in the Silicon Valley. Her husband, an Indian-American who immigrated to the United States, still has family in India. They live comfortably, although the stress on the job market does worry them in the current economy. Asha, on the other hand, has always lived in a small village. She, her husband and two children live in a hut with a tin roof. They use a communal water source and struggle to make ends meet as best they can. Asha's marriage was arranged and she is more submissive in her role as wife. The money offered to Asha for having someone else's baby is more than she has ever seen in her life. Even despite her reservations about being a surrogate, she reminds herself of the money, and the good it will do. Many of the women Asha encounters at the House for Happy Mothers are in similar boats, needing money. Several of the women have come back again and again to have a baby, realizing the money that seems so great in the beginning doesn't go as far as they had hoped--or it was mismanaged by their husbands. I found the beginning of the novel to be somewhat slow. It took me awhile to warm to Priya, even though she was the character I could most identify with. Asha's story stood out to me at first, perhaps because of her situation. I soon was invested in both characters' lives. The author is very honest in her portrayal of her characters, and I think this is what I liked best about the novel. Priya and Madhu are not perfect, nor is their marriage. That same can be said for Asha and her husband. Throughout the novel, the author does not hold back from sharing the strain their situations have on their lives and their relationships, including their relationships with others. Priya's relationship with her mother has always been strained, and becomes more so with her decision to use an Indian surrogate. It was interesting to see the dynamics play out between all the characters, including Priya and Asha. The reader also sees the characters grow as individuals and in their relationships, providing some balance. For all I felt for Priya and wanted her to be able to have the baby she longed for, I couldn't help but feel for Asha. She was not comfortable with what she was doing no matter how many times she tried to justify it to herself. She had doubts, both morally and emotionally. How do you grow a baby inside of you and not get attached? The party line was that the surrogates are giving gifts to families who want but cannot have children. And yet how much of it is really just about the money? Even for the doctor who runs the clinic. It is a business, after all. Priya does wonder if she is doing the right thing. Is she exploiting Asha? Her mother feels she is. Malladi does not shy away from introducing that idea in the novel. The author takes a more subtle approach, leaving it (mostly) up to the reader to decide. The use of surrogates in India has been on the rise in recent years. Impoverished women are the perfect target, vulnerable and in need of money to better their own lives or those of their families. They enter into a contract to have a baby for middle-class to wealthy families overseas. It's an agreement believed to be beneficial to both parties--a business transaction providing much needed money to the surrogate and giving a baby to a family that wants a child. Often the surrogates feel shame, hiding their condition, lying that they lost the babies after they are born--at least as was depicted in the novel. There are no regulations in place currently and prices are much lower than you would find in the United States and other European countries for surrogacy services. It is obvious why this has become such a popular practice. As I read Asha's story, I could not help but feel uncomfortable with her situation, feeling that she and the other women were being taken advantage of. 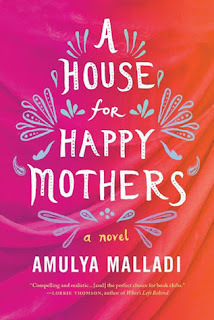 I found A House for Happy Mothers to be an emotional and thought provoking book. As I said, I was left feeling uncomfortable to some degree. Author Malladi takes on a controversial and relevant topic, offering the reader a glimpse at two different sides of the issue. Her attention to the cultural, social and economical differences and the emotional impact on both parties were right on target. I have read several of Amulya Malladi's novels in the past and enjoyed each of them. This one is among her best yet. To learn more about Amulya Malladi and her work, please visit the author's website. She can also be found on Goodreads and Twiter. I hope you will check out what others had to say about A House for Happy Mothers on the TLC Book Tours route! That certainly does sound emotional. I cannot imagine being a surrogate so being a reluctant one must be very difficult. Kathy - I felt for both women and their situations. Such a hard situation on both counts. Sounds like a box of tissues might prove useful whilst reading this one. On a different note, I've tagged you on Pen and Paper should you wish to play along. Tracy - I seem to be reading a lot of those types of books as of late. I will stop by your blog soon. I'm afraid I've been away from the computer more than on it as of late and it's made me a bad blogging friend. The whole subject of infertility is such a minefield of emotions and controversy but the surrogate aspect is one I don't feel like I've seen much of. This sounds fascinating and heartbreaking all at once. I like that the author portrays everyone as flawed and real. Katherine - It really is. I don't have an issue with surrogacy necessarily; it's more a question of whether these women in third world countries are being exploited. It really gives one pause for thought. Jenclair - I get it. I was feeling the same way as I read my last book--which I forced myself through. I probably should have set it aside for something lighter, but I kept at it. I wasn't too eager to read it anyway, which probably didn't help. It was a postal book club pick though, and so I kind of felt obligated to read it. When I was struggling with my own infertility I considered using a surrogate ... this book is sure to hit some tender spots for me. It sounds amazing. Heather - It's an interesting topic. As I was telling Katherine above, I don't have an issue with surrogacy itself, but I do question the conditions and treatment under which women like Asha go through. I think it's definitely a viable option for women who are struggling to have a child of their own. If you get a chance, I hope you enjoy reading it! Mystica - I would be curious what you think if you do read this one! Verushka - I hadn't realized this was such a prevalent practice in India. It really is worth looking into. It raises a lot of questions and is very thought provoking. Even though the start was slow, this sounds like a good one. I can't even imagine what the surrogates go through, especially in countries like India, where these women are desperate for the money and might be taken advantage of. Being a mom, I just can't imagine it. Naida - Yes, it can't be easy for the surrogates. Some of the women who had done it before had an easier time of it emotionally, but I imagine it still isn't easy, even at that point. So many of them are in such vulnerable positions. It really makes one think. Wow, surrogacy has been in the news so much recently, particularly issues surrounding the ethics of it. There was an excellent Radiolab article about a gay couple from Israel (I think) trying it with a woman from Nepal. I highly recommend a listen. Aarti - After finishing this book, I did a little research and the articles I found were almost spot on with the events in the book. Straight out of the headlines, so to speak. I had no idea. I'll look for the Radiolab article you mentioned. Thanks! This sounds like a powerful and emotional read and requires a right frame of mind to read it, well at least to me, that is. Will have to keep this book in mind. Melody - I hadn't expected it to be quite as heavy as it was, but it's definitely worth reading. I'm just getting started on this one and I do appreciate that Malladi straight off the bat points out the moral issues involved. Lisa - I look forward to reading your thoughts on this one when you finish!